Dining is a further world of discovery, with Thailand offering almost endless possibilities for relishing exciting new tastes, rich in quality and choice. Thai cuisine with its tangy tastes is indeed a gastronomic art. Creativity in cooking rises from the Thai’s love of good food apart from the wealth of ingredients available. The country possesses vegetables and fruits, herbs and spices in galore with succulent seafood and fresh farm produce, and all are wonderfully used in tempting recipes. From Royal Thai cuisine, based on menus traditionally served at the regal banquets of old, to four very distinctive styles of regional cooking, the discovery of new and tempting dishes is almost endless. However, the variety is incredibly delicious. 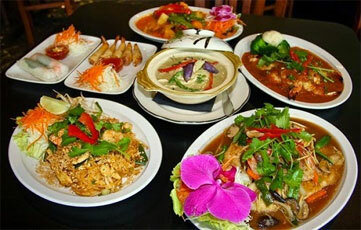 The essence of Thai food which makes it an outstanding culinary art is its subtlety. The main thing lies in the harmony of a blend of hot, sweet, salty and sour flavours. Amazingly for something that tastes so good, Thai food is also highly nutritious. With its emphasis on the freshest produce, green vegetables as well as herbs, along with a fondness for fish and poultry, Thai cooking is as much a delight of the health-conscious as for the gourmet. Apart from the Thai food, other cuisines of the East and West are readily available at any part of the country. For the ultimate souvenir, you can learn the art of preparing Thai food at various cooking schools, both in Bangkok and other major destinations, and so take a taste of Thailand back home with you. 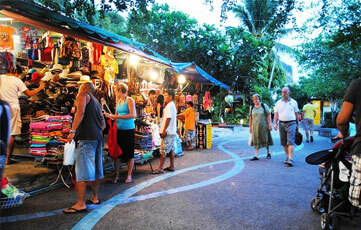 Thailand is a shopper’s paradise with its sophisticated Plaza(s), chic emporiums, bustling bazaars and street stalls. With an extensive range of not only what to buy but also where to buy, shopping is at its best here. The country has been offering a nurturing environment for the creative spirit since centuries. However, Thailand pulses with artistic innovation at present times. Inspired by traditional crafts, talented Thai designers are finding imaginative new applications of ancient forms and styles, transforming fabrics, gemstones, precious metals, wood, clay and synthetic materials into international-quality contemporary clothing, fashion accessories, jewellery, home-furnishings and décor items. Of Course, classic buys such as exquisite Thai silk and precious antiques remain timeless, while top inter-national brand products are very much in demand for the moment. The creative development in the country led to the growth of a stunning range of modern air-conditioned shopping plaza and malls which houses impressive department stores as well as some independent boutiques. Here, you can shop for today’s buys, from designer clothes to computer disks, with complete comfort and ease. Apart from a staggering variety of local handicrafts in a wide range of materials, from bronze to celadon pottery, Thailand also offers excellent shopping for fashions, both custom-made and off-the-peg, with Thai silk being, of course, the favored fabric.